VITAL UPDATE: Expect A Dramatic Bounce, IMMINENTLY! October absolutely decimated cannabis stocks. The biggest names in the industry (companies worth several billion dollars in market cap) took huge hits. The much smaller businesses that are working their asses off to compete with the big boys saw their share prices plummet as impatient investors decided to jump ship, due to volatility. Fundamentally, with (1) Canada’s fully-legalized market now at hand, (2) three states (Michigan, Utah, and Missouri) voting to legalize, and (3) key personnel in the government getting into influential positions with a positive approach to this process, it’s time for a major bounce. 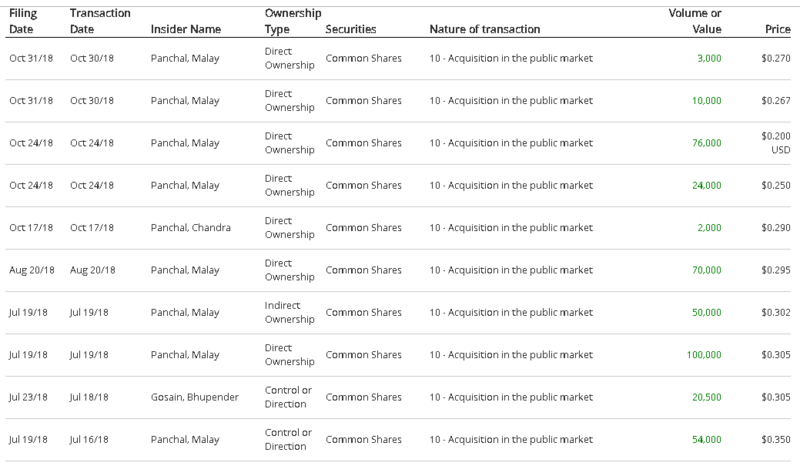 In fact, Malay Panchal, founder/CEO of PURE Global Cannabis (TSX-V: PURE & US: PRCNF), is voting with his wallet big-time. Between July and the end of October, Mr. Panchal has pulled the trigger on 380,000 additional shares on top of his existing position, which was substantial going into this. Looking at the price he paid, we now have the opportunity to lock in a price even better than his, thanks to the excessive October selling across the board, regardless of the underlying business progress. Canada has forever changed the course of the industry, so Canadian IP (intellectual property), along with the competitive advantages of their companies being first, are allowing management teams to floor it and accelerate the speed at which they expand, export, and sell products. The biggest bargain following the October massacre is PURE Global Cannabis (TSX-V: PURE & US: PRCNF)! Get this: Health Canada just completed their review of the company’s sales license application and they should be within walking distance of officially receiving it, judging by previous instances with other companies. This is a major development because the company will be able to sell its products. 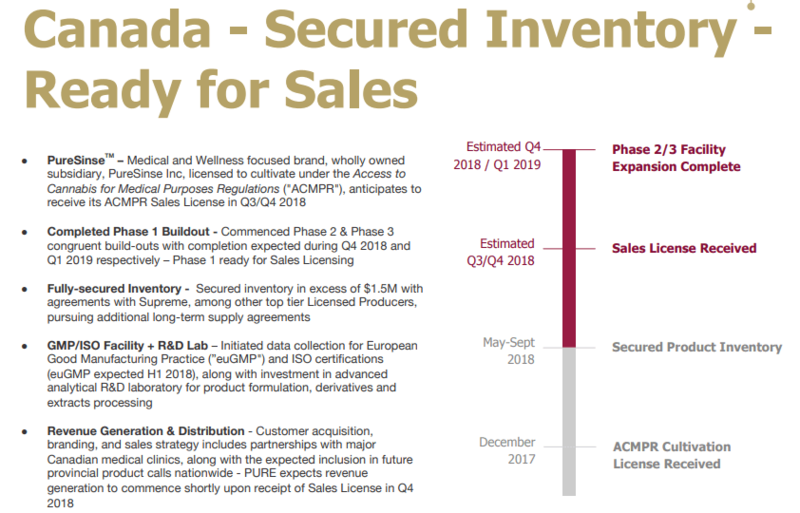 They will be one of only a few dozen companies with a medical-grade license in Canada, and certainly one of the cheapest among the publicly-traded ones. 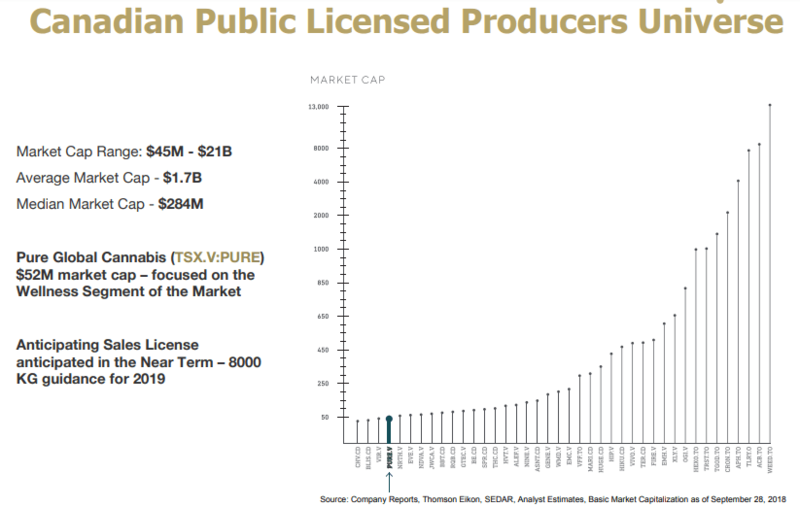 As it stands, out of over 30 medical-grade license holders, you can see we’ve uncovered a stock whose market cap is 88.1% cheaper than the median! A 848% rally would put it on a level plane with its peers, so the potential is enormous. What’s even better is that PURE Global Cannabis (TSX-V: PURE & US: PRCNF) is so young that its entire growth schedule is ahead of it. October has genuinely handed us a rare second chance! Between 2014 and today, more cannabis stocks have doubled and tripled than almost any other sector. What I want to do is build a portfolio of Canadian cannabis stocks in advance so that any major announcement from Washington, be it even a few years away, along with our current tremendous legalization trend taking place globally, would hand us a windfall of profits. I’ve seen what happens to stocks of other cannabis companies once Health Canada finalizes the review of the sales license application – they tend to rocket higher. This is precisely where we find ourselves today with PURE Global Cannabis (TSX-V: PURE & US: PRCNF). IMPORTANT DISCLOSURE: I am LONG shares and plan to hold them, as my internal calculations of intrinsic value are significantly higher than CAD$0.235. Drop everything and research this rare opportunity now!